2 pack of 8" white polishing pads 2 pack 8" black swirl pads A cleaner-polish that removes minor scratches, swirl marks, and oxidation. When used according to directions, it will produce a high gloss, swirl free finish that won't wash away. Kiwi Paint Solutions swirl Remover is used as a glazing step to remove minor buffing swirls, micro-surface imperfections, and oxidation. Designed to be a last step in the buffing process. Leaves a durable, swirl-free mirror finish. A very aggressive water based compound that is designed to remove scratches as coarse as 1000 grit from new and aged paint. 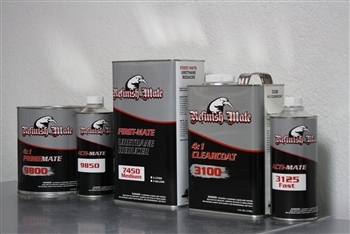 Kiwi Paint Solutions Cutting Cream buffs to high shine with no waxes or silicone. With it's water based formula, this cutting cream will not stain, and cleans up easily with water even on rubber surfaces.